The bags shown here are approximately 13 1/2 inches high by 19 inches wide. This bag has the DSPDL-1 locking zipper on it. It can be made with a non-locking zipper if security/privacy is not a concern. It can be made in a wide choice of colors and fabrics as well as any desired size. It has a clear window sewn on the front side which is open on one side which you insert a card/tag for identification. This bag has a carrying loop on the top edge but can be made without a loop and could be considered and appear as a big locking envelope. 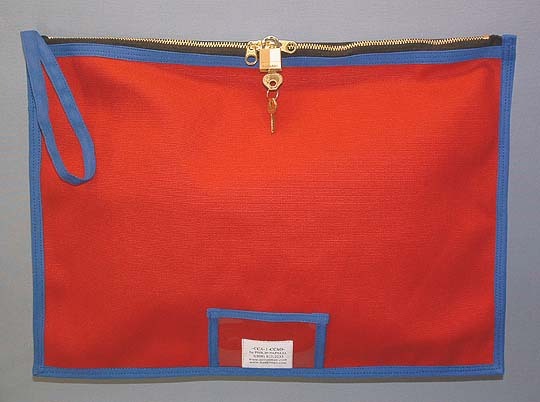 As an option we can eliminate loop on left side and sew on two looping handles on center which would allow you to carry the bag like a briefcase. 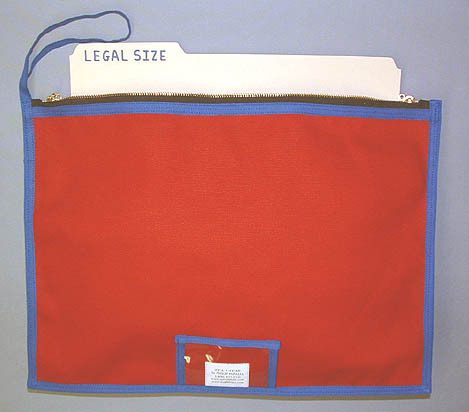 The top picture displayed above shows the you can easily insert a legal size file folder inside horizontally. This bag is ideal for inter-office transportation of files, folders, charts, medical/patient records, documents or whatever and can certainly be used as a courier bag. It would also conform to HIPAA requirements for privacy. These bags can be made without the outside binding/trim and this would give the bag a wider holding capacity inside. It can be made with center handles/straps if needed. As with any of our products we can build it any size and make changes as needed to accommodate your end use. Please contact us with your specific or custom request. All bags with be priced according to things like size, fabric choice, zipper options, etc.